When the doctor first tells you that your child needs a feeding tube, it can be a very scary moment. No one anticipates their child having medical complexities that cause feeding issues, and to hear that your child isn’t able to get their nutritional needs met through eating by mouth is overwhelming. While this is initially frightening, this last resort may be the best option for making sure that your child’s needs are met. Once you have learned the best way to feed your child, it may actually be a relief. Unfortunately, because there isn’t a lot of awareness about the complexities of medically fragile children, there are many misconceptions about feeding tubes out there. In this blog, we go over common myths about feeding your child through a tube, and the truth about feeding tubes. MYTH: You need to try harder to feed your child orally. This can be a frustrating thing to hear because as a parent, you have done everything you can to make your child eat. It’s part of human nature to want to feed your children. The truth is, some children need the additional nutritional support of a feeding tube, and there is nothing that their parents can do to change this fact. No parent is just too “lazy” to teach their child to eat — they face feeding tubes as a last resort. Feeding tubes are a supplementary solution for a child who either cannot eat orally or are not getting the nutrition they need from eating orally. MYTH: Children with feeding tubes can’t eat by mouth. This isn’t necessarily true. Some children need feeding tubes to supplement oral eating. As long as it is approved by their doctor, your child can still eat and drink by mouth. In fact, oral feeding should be encouraged to help them with their eating skills. MYTH: Once you tube feed, your child will need to do it forever. While there are some medical conditions that require tube feeding for your entire life, many children only temporarily need feeding tubes. Once it is no longer a medical necessity, a child can be weaned off of tube feeding. It’s hard to know how long a child will need a feeding tube, particularly for rarer medical conditions that aren’t fully understood. This is why it is important to teach your child oral feeding skills — you don’t know when they will no longer need to be tube fed and will have to learn to eat for themselves. MYTH: Feeding tubes limit the physical abilities of children. Children will feeding tubes can run, jump, swim, climb, play, and participate in sports, just like children who eat by mouth. Even if your child needs to be continuously fed through a tube, it is possible to wear feeding pumps in backpacks so they can still be physically active. MYTH: You need to use formula to tube feed your child. Depending on your child’s specific medical condition, you have options for what you feed them through their tube. Some parents choose formula or breast milk, while others will blend foods to feed through the tube. This is something you can discuss with your doctor to determine what is best for your child and your lifestyle. 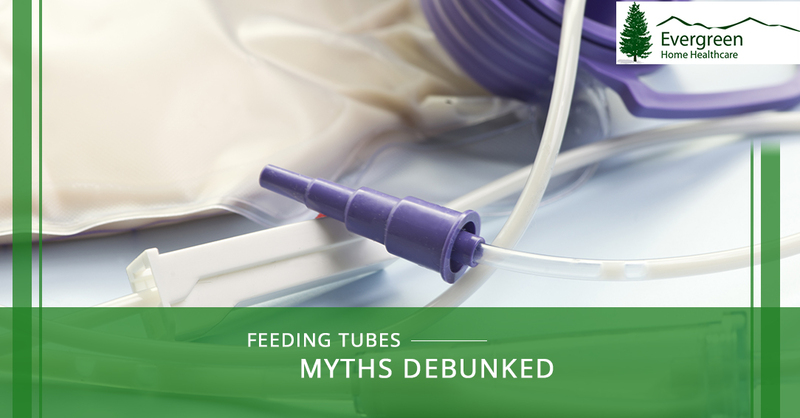 MYTH: You have to get tube feeding down perfectly immediately. Tube feeding is like any part of parenting: you’re going to make mistakes. The key is to learn from them. When you first start tube feeding, it’s going to be a process of trial and error. In addition, each child is going to be different when it comes to tube feeding and what works best for them. It will take some time to figure this out. Don’t beat yourself up about not being perfect! With time, you will figure it out and be easily tube feeding your child in no time. MYTH: You need round-the-clock medical care for a child with a feeding tube. For some medical conditions, pediatric home health care will be necessary and a welcome relief. For others that simply require tube feeding, you will be able to figure it out fine without in-home help. This will vary according to your child’s specific condition and your schedule. In the event that you do need pediatric home health care in Denver, Evergreen Home Healthcare would be honored to help. Contact us today to learn more about our in-home health care for medically fragile children.